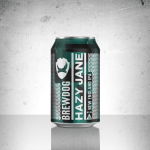 Hazy Jane is a Vermont style IPA, with low background bitterness, loaded with intense juicy fruit character. Pineapple, stonefruit, mango, light resin and hints of lime peel – this juicy IPA is full-bodied and smooth, enhancing the soft ripe fruit flavours. Unfiltered and only available from BrewDog bars and in cans from our online shop!